We are bracketed among the reliable Manufacturers, Suppliers and Exporters of Electroperm Heavy Duty Chuck for Quard Pole from Maharashtra. Heavy Duty Chuck we make available is suitable for light milling i.e. 3 to 6mm depth of cut at recommended speed and feed. One can obtain the Heavy Duty Chucks at nominal rates. Work holding device for conventional & CNC milling m/c. Cold Device as it doesn't require power continuously except for short period of activation & deactivation. Suitable for light milling i.e. 3-6 mm depth of cut at recommended speed & feed. Maximum material removal is possible. Economical for operation & maintenance. No accidents due to power failure. Slippering force is 2.5 - 3.5 kg/cm2. Vertical Lifting Force is 40 - 45 kg/cm2. Variable supply unit to vary power which helps in alignment of jobs. 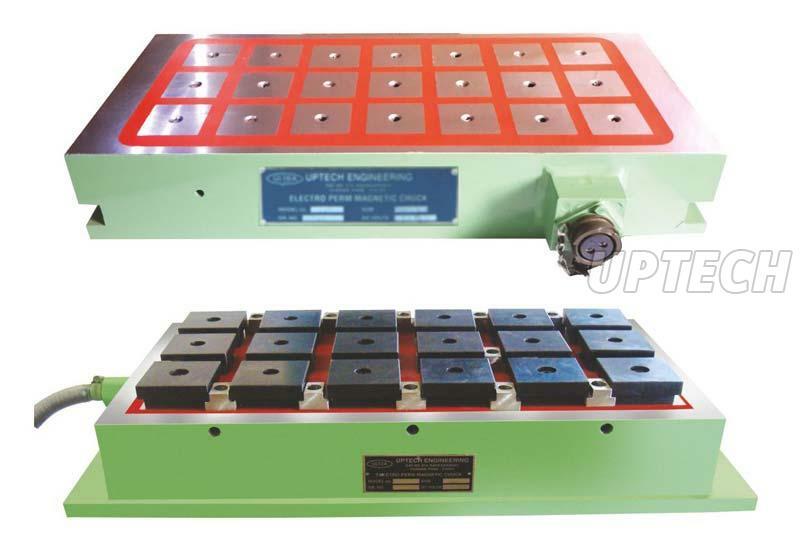 Chuck is tested for slippering force, Waterproof test, Electrical & Demagnetizing tests.